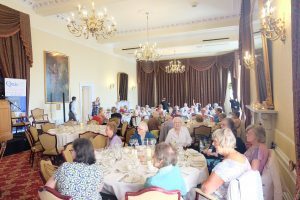 Around 75 retired Queen’s Nurses have travelled from across Scotland to meet old friends and colleagues for a lunch at Crieff Hydro. Buses from Edinburgh, Glasgow, Inverness and Aberdeen brought the network of retired QN’s together for the 2017 Annual Gathering. The event allows those attending to share their news and find out the latest information on what the Institute is doing while enjoying a great lunch. This year, the audience heard from Catherine Morrison, a retired QN from Lewis who has written a book charting the history of Queen’s Nursing in the Western Isles. 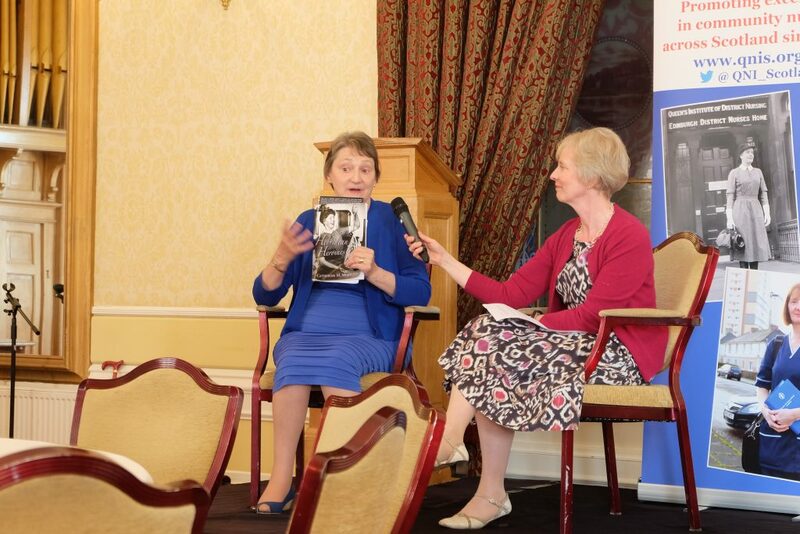 Clare Cable, QNIS chief executive and nurse director, took to the stage with Mrs Morrison to ask her questions about life as the author of Hebridean Heroines. Q: What inspired you to research the history of Queen’s Nursing on the Outer Hebrides? I was a district nurse and I visited many district nurses and we like to talk. As I visited them as patients I found they told me stories – some that I could relate to and some I couldn’t. I decided to do a little study to capture some of those stories. 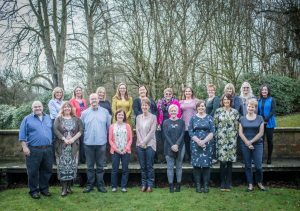 Once I did the small study, with the help of the QNIS, I thought it wasn’t quite enough so I did another larger study interviewing 30 district nurses. They were all from the Hebrides, most were Queen’s Nurses and most of them were living on a non-doctor island. The 40s, 50s, 60s and 70s, was a very unique time for district nursing being lone workers. I found they depended on their own skills, their own community and the ferry men. The ferry men were very important to their lives. So much so that many said they couldn’t do their jobs without the ferry men. Q: Why did you call the book Hebridean Heroines? These ladies were heroines. The definition of a heroine is – “doing what is right, regardless of the consequences, not giving up until the goal is accomplished” – I think these ladies did what was right and I really believe they were heroines and they were all from the Hebrides, so that is where the title came from. Q: In the interviews, did you get a sense of what made the Queen’s training unique? Most of these ladies were registered nurses, midwives and many had other training, but they all said it was their Queen’s training which was most important to them. One of them said: “They trained you in such a way that you could go to the desert and still manage.” There is something about the Queen’s training that is different. I have never met a Queen’s Nurse who isn’t confident in their work and proud of being a Queen’s Nurse. It could well be discipline that made Queen’s Nursing training different. Q: If there was one message from the voices of the past to pass on to today’s Queen’s Nurses, what would that be? I think when we look at the ladies from the past, you could depend on them. I think nurses are dependable and do what they say they are going to do. The community could depend on the Queen’s Nurse, they were there at all times.